have many inside-the-pant holsters to choose from. For the utmost in concealability the Galco USA holster is constructed of premium horsehide, rough side out to provide excellent interior grip. The USA holster features leather sewn in sight rails and the Galco new generation III J hook is designed for 1.25" belts. Available in right- or left handed. If your firearm is not listed yet check the Galco Stealth model as an option. I'm on my second one of these holsters. I don't remember exactly how many years the first one lasted, 5-6 years. 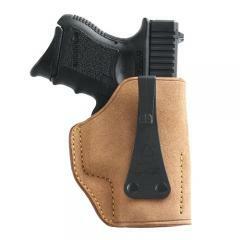 I have really liked this holster and use it daily for my concealed carry Glock 36. It is very slim and the J-Hook is very subtle. I wear my gun on my right hip and occasionally I snag the hook on things like chair armrests or door frames. Not hooking on those things but just hit them and snag a bit. Eventually my hook broke on my first holster but it had lasted for 5-6 years, as I mentioned before, and I was so happy with it all that time that I immediately ordered a new one to replace it. I really like the simpleness of this holster. There is no strap over your gun, so don't do flips or jump rope or your gun can fall out. But I've been carrying with this for about 10 years now and it has been great. Outstanding, also very professional follow up, five stars.